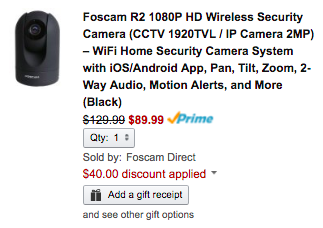 Foscam Direct via Amazon offers its R2 1080p HD Wireless IP Camera for $89.99 shipped when promo code R2DECMBR is applied during checkout. For comparison, this camera usually sells for $130 at nearly every online retailer including B&H. Today’s deal is the lowest that Amazon has ever sold it for and the best that we’ve tracked. This fully-featured IP camera has smartphone connectivity, a 1080p HD video feed, 110-degree viewing angle and 13 IR-LEDS for night vision. All of this comes at more than 50% less than the price of the new Nest Cam Outdoor. Nearly 200 Amazon customers have left a 4.1/5 star rating. You know what you need from a WiFi security camera: to ensure the safety of your home, children, pets, or business. You want the ability to stay connected to what you care about: to live monitor or record what’s happening, perhaps with the aid of scheduling functions or maybe through simple but powerful motion trigger and smart alert features. You also need the recordings to be smooth and clear so that the footage is truly useful, and so you don’t have to struggle to discern the details of a scene. You want the features you need at the highest quality, without extras you don’t need. In other words, you want full choice over your recording method (HDD/SD/NVR/Cloud), and you want to spend only for what fulfills your needs.